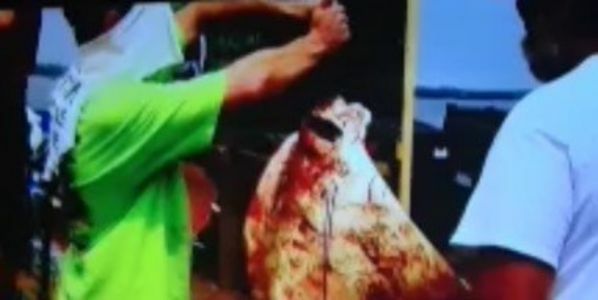 petition: Stop the Mutilation of Chesapeake Rays!! Stop the Mutilation of Chesapeake Rays!! Fred's Sports in Maryland sponsors a cruel and inhumane competition called "the Battle of the Rays." This competition was held on the Patuxent River (in the Chesapeake Bay watershed), and video taken by an animal rights organization shows cownose rays (often referred to as stingrays) shot with arrows, gaffed with hooks and then beaten with aluminum baseball bats. The 'sportsman' with the heaviest ray won prizes. Once the brutal competition was over, the dead rays were thrown into the bay like trash. Sadly, many of the rays were pregnant, so not only did they die, but the next generation of cownose rays were also destroyed. Rays, like sharks, give birth to only one pup at a time (after a 10-12 month pregnancy! ), so it's a bad idea to be killing these animals so indiscriminately! When contacted by news channels the Maryland Department of Natural Resources admitted they don't know enough about the cownose ray population to tell whether competitions like this are a problem! Sign our petition to tell the Governor of Maryland, the Maryland Department of Natural Resources, the Chesapeake Bay Program, the Maryland General Assembly and Fred's Sports to put an end to cruel contests like this, and gather more information to manage the ray population more sustainably. Put an end to cruel and unsustainable competitions like the "Battle of the Rays!" It's outrageous any business would want to sponsor such a bloodbath, and ridiculous that our natural resource agencies would allow questionable contests like this to exist. Please take action immediately to end future cruel contests, and begin to collect the data necessary to manage the cownose ray population sustainably into the future. Good news! Legislation to ban the killing contests has been introduced in the Maryland legislature. A number of organizations are working to advance it, including those in the Save the Rays Coalition. We are urging Maryland residents to contact their legislators and sign and share the petition. Happy signing everyone!